The British economy grew at its slowest quarterly rate in more than five years at the start of 2018, according to a preliminary estimate from the Office for National Statistics released Friday. Gross domestic product — the most widely used measure of economic growth — increased just 0.1% in the quarter. 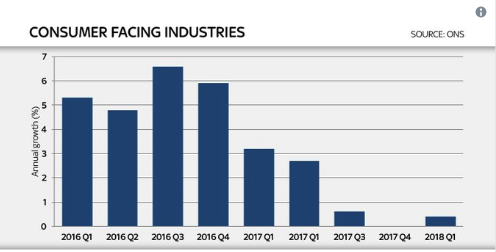 Growth in the final quarter of 2017 was 0.4%. 2018’s first GDP figure is the lowest reading for the UK economy since it contracted in the fourth quarter of 2012. That contraction followed the end of the London 2012 Olympics, which had significantly boosted the economy in the previous quarters. On an annual basis, the ONS said that the economy grew 1.2% compared to the same time last year. “Our initial estimate shows the UK economy growing at its slowest pace in more than five years with weaker manufacturing growth, subdued consumer-facing industries and construction output falling significantly,” Rob Kent-Smith, the ONS’ head of national accounts said in a statement. The biggest downward pressure on the economy in the quarter, the ONS said, was a sharp fall in construction output, something that was impacted heavily by the colder than normal weather and large amounts of snow seen in the first three months of 2018. Construction output fell 3.3% as projects were halted during the snow, knocking as much as 0.2% off the UK’s overall GDP reading. 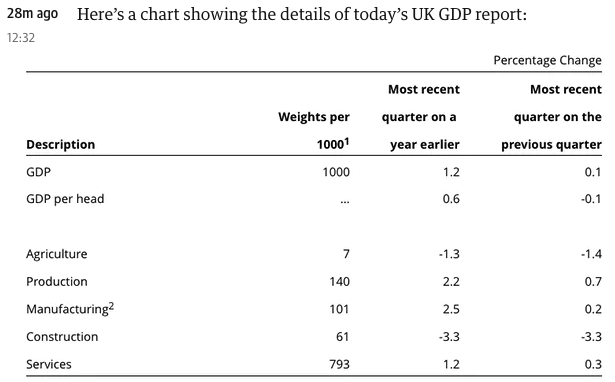 As usual, services, the dominant sector of the UK economy, accounted for the majority of growth over the data period. Services account for roughly 80% of UK output, and grew 0.3% in the quarter, behind the only production in terms of sector growth. Despite the weak data, UK GDP has now grown in 21 consecutive quarters, with the last fall coming during the post-Olympic economic contraction. Early reactions from analysts suggest that the poor GDP number has ended any hope that the Bank of England might raise interest rates at its May meeting. Markets had been expecting the BoE to hike in May, but a string of weaker than expected data, as well as dovish comments from Governor Mark Carney, had subdued those hopes. Friday’s data is another setback. “The downside surprise in Q1’s GDP figures is probably the final nail in the coffin for the chance of an interest rate hike in May. The 0.1% quarterly rise was below the consensus estimate and the MPC’s forecast of 0.3%,” Paul Hollingsworth, a senior UK economist at Capital Economics said in an email.